The state of Missouri is a hidden gem for cave & cavern scuba divers. 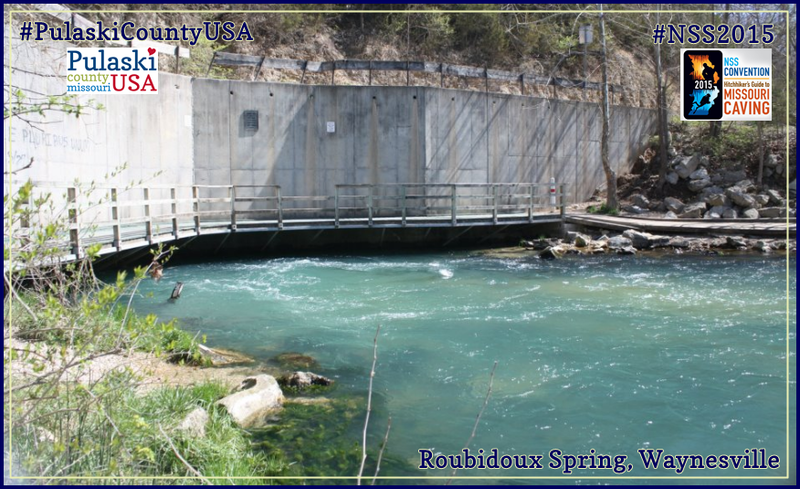 Waynesville, the heart of Missouri cave country, is also home to Roubidoux Spring. Roubidoux Spring is a notable landmark freshwater spring. It is often mentioned as one of the best cave diving springs in the country and is routinely allowed to QUALIFIED and certified cavern or cave divers. ALL DIVERS must register with Waynesville Police Department (573.774.2414) before entering. Roubidoux Spring at Laughlin Park in Waynesville, MO. Image courtesy of Connie Feighery. 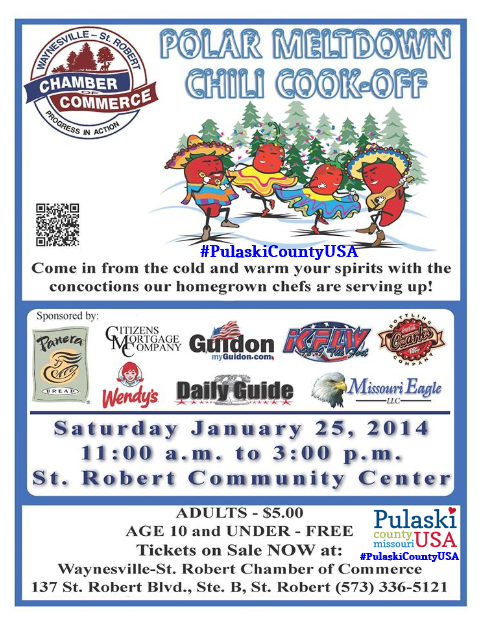 The following article was published in “History Pulaski County Missouri, Vol. II, 1987”. 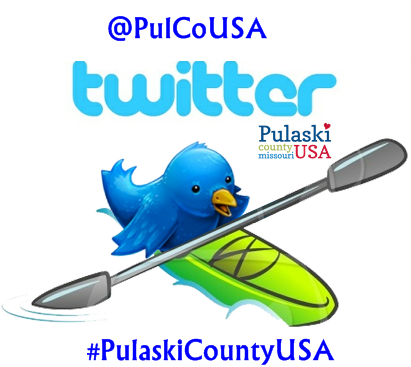 Special thanks to Pulaski County Museum and Historical Society for allowing us to share it here. Prior to September 1977 several people had made relatively short penetrations into the upper level passage of Roubidoux Spring- Carlson, Delaney, Rimbach, and Tatalovich. During the summer of 1977, Carlson and Delaney made several dives to the limits of the then known passage in an effort to extend penetration. Their maximum penetration was 425 feet and a maximum depth of 120 feet. On September 3, 1977 Miller and Fogarty made their first dive in Roubidoux Spring. They reached the end of the Carson-Delaney line, found the lower level passage, and added 570 feet of line for a total penetration of 995 feet. The lower level passage runs at an average depth of 140 feet and ranges from 5 feet high and 12 feet wide to 20 feet high and 50 feet wide. On the afternoon of September 3, Miller and Fogarty made a second dive and added another 435 feet. The new penetration was 1430 feet. The passage size, direction, and depth were holding a relatively constant at termination. 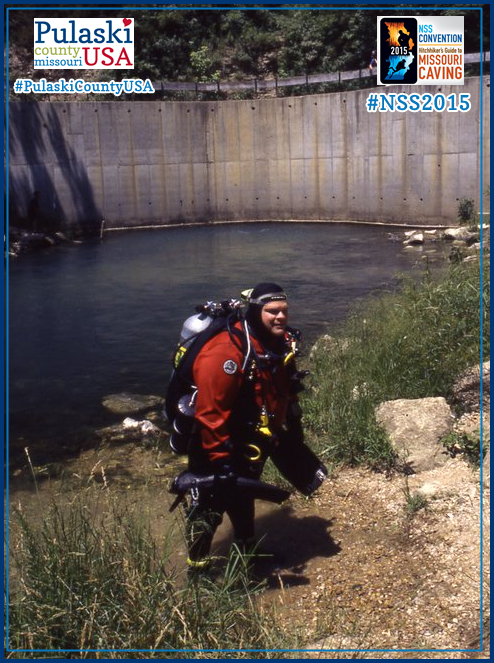 A cave diver at Roubidoux Spring in Waynesville in Pulaski County, Missouri. September 4, 1977: Miller and Fogarty made a survey trip into the lower level, starting at the end of the Carlson-Delaney line surveying 535 feet. They also removed 35 feet of line to center line in the passage. 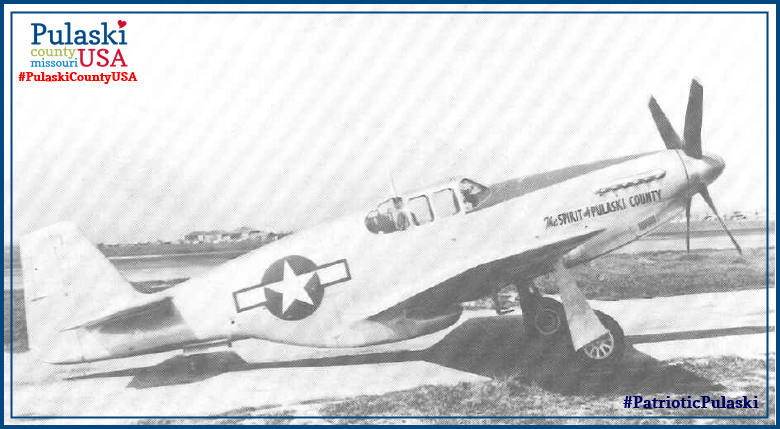 A minor decompression accident occurred on this dive causing Miller to be hospitalized for a short period. This delayed further exploration for two weeks. 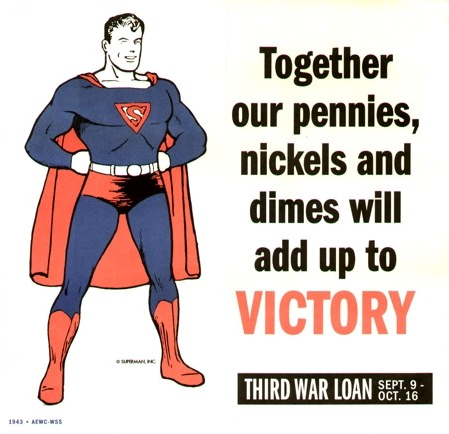 September 17, 1977: Miller and Fogarty pushed to the end of the line in Whichaway Ave. and started adding line. They immediately entered the “Big Room”, which is 40 feet high and 80 feet wide, depth on the floor was a constant 160 feet. The floor was smooth hard silt with very little breakdown in contrast to the floor in Whichaway Ave. which is all porous breakdown. 225 feet of line was added, making a total penetration of 1620 feet from the entrance and a maximum depth of 160 feet. The Big Room was remaining constant at the termination of the dive. September 18, 1977: Miller and Fogarty made a survey dive and routinely surveyed the back part of Whichaway Ave.
September 18, 1977: Miller and Fogarty made a survey trip on the Carson-Delaney section of the line, completing the survey of the known passage. 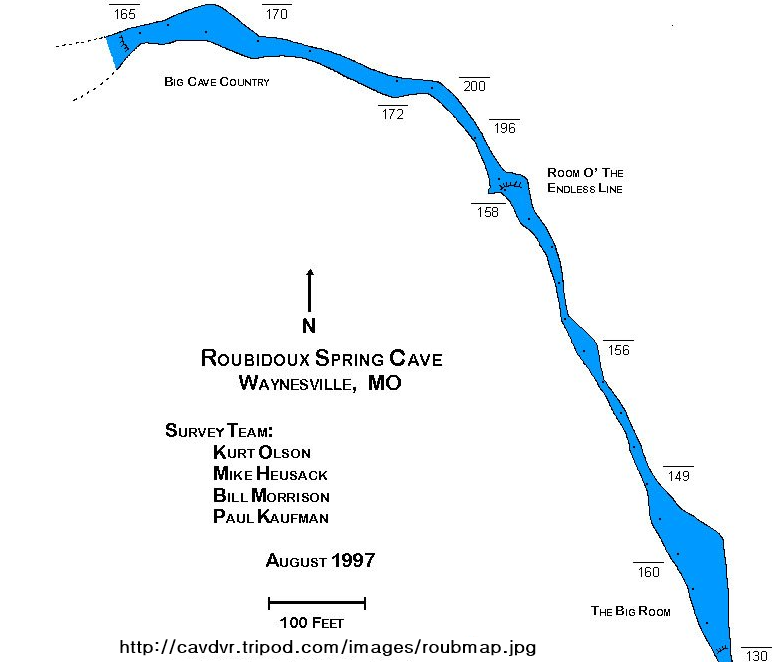 Exploration of Roubidoux Spring Cave has progressed since this survey was done in 1977. 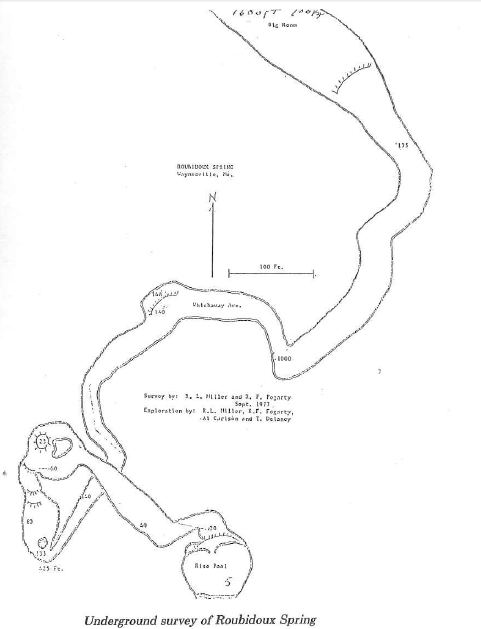 This survey from 1997 shows two areas, “Room O’ The Endless Line” and “Big Cave Country” that were not known at the time of the 1977 survey. This image has been altered to highlight these additions. For the complete map visit http://cavdvr.tripod.com/images/roubmap.jpg. 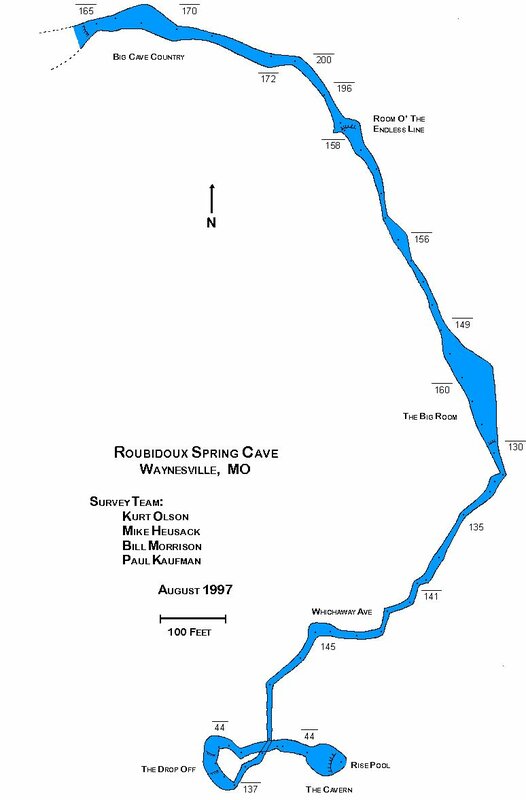 Roubidoux Spring Cave will be offered during the National Speleological Society (NSS) Convention, hosted in Waynesville, Missouri July 13 -17, 2015. Are you a birder or a bird watcher? 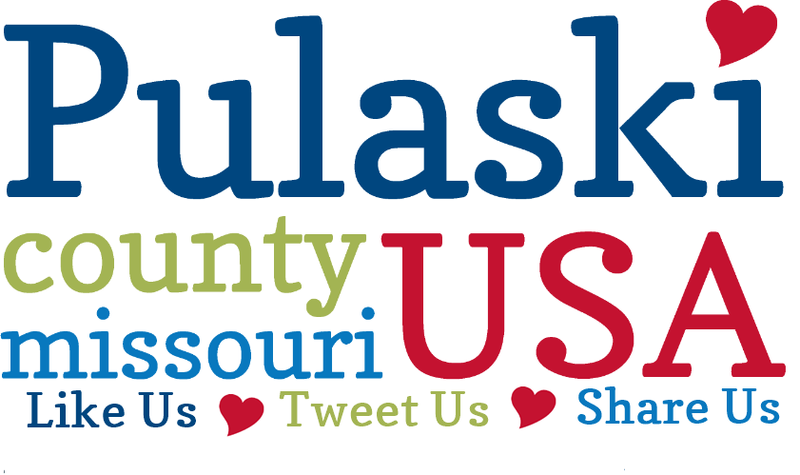 If so, flock to Pulaski County, Missouri! 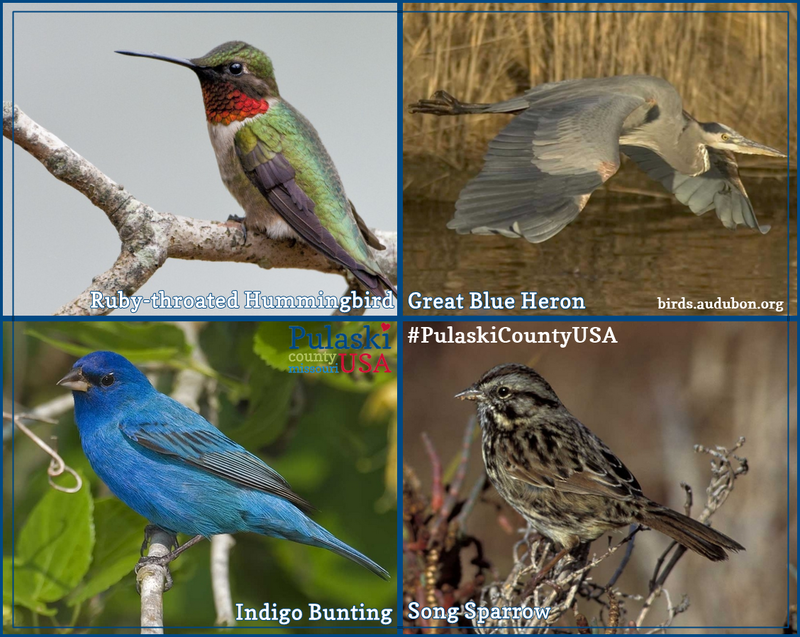 Over 400 different kinds of birds have been identified in the state, with over 100 species already identified in Pulaski County. Almost 40,000 acres of Mark Twain National Forest lie within our boundaries. 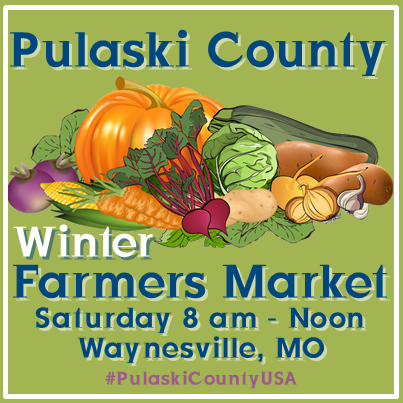 Pulaski County also offers two Missouri Department of Conservation Areas, four public river accesses, two towersites, and an impressive public park system along the Roubidoux River in Waynesville. Birding is the most popular spectator sport in Missouri and is a wholesome hobby and activity for all ages. Bird watching can provide quality one on one time with Mother Nature and is also a great way to introduce a younger generation to the great outdoors. 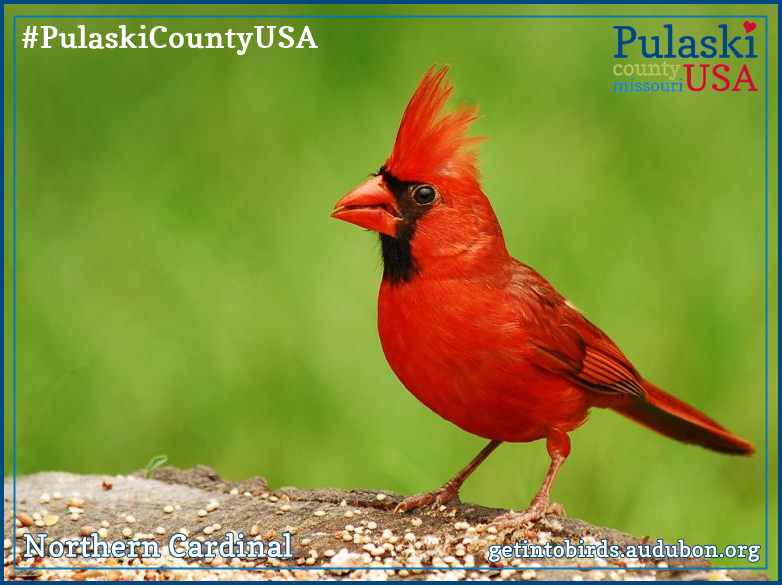 Whether hiking, biking, or canoeing in Pulaski County, Missouri you will see songbirds, birds of prey and quite possibly the magnificent Bald Eagle. Bloodland Lake (Fort Leonard Wood) is a popular fishing location that is handicap accessible. Anglers fish here for Bass and Sunfish. 36 wild bird species have been identified in this 40 acre wetlands habitat including Canada Goose, Northern Shoveler, Ring-necked Duck, Lesser Scaup, and Bufflehead. 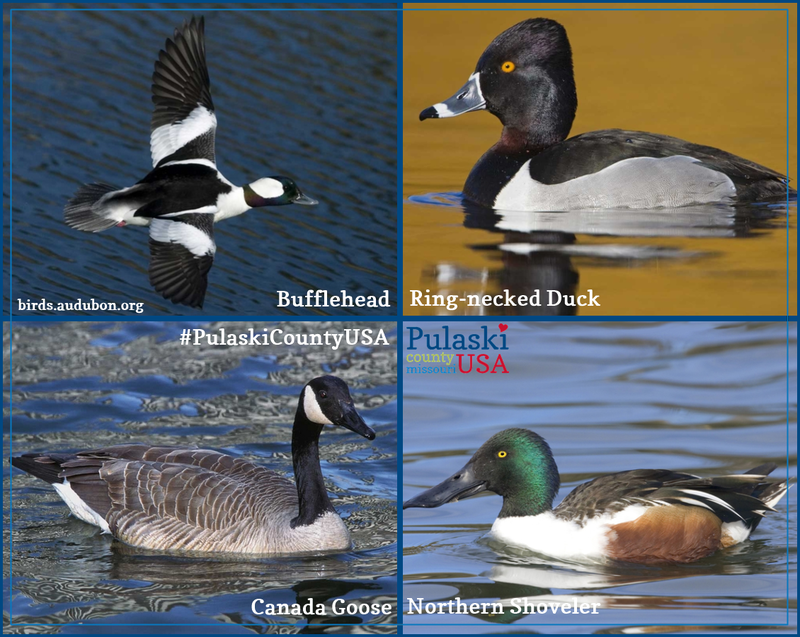 Bufflehead, Ring-necked Duck, Canada Goose, and Northern Shoveler are waterfowl species that can be seen in the wild at Bloodland Lake on Fort Leonard Wood in Missouri. Birders have identified over 30 other species of wild birds in this area. 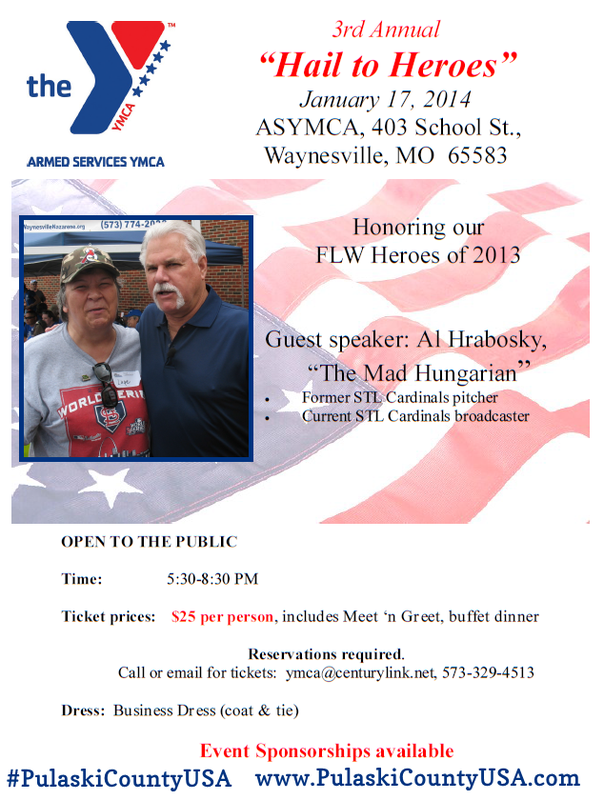 Driving Directions to Bloodland Lake on Fort Leonard Wood: From I-44, take Exit 161. Go south on Business 44 to the front gate of Fort Leonard Wood. Obtain a map and directions at the front gate. 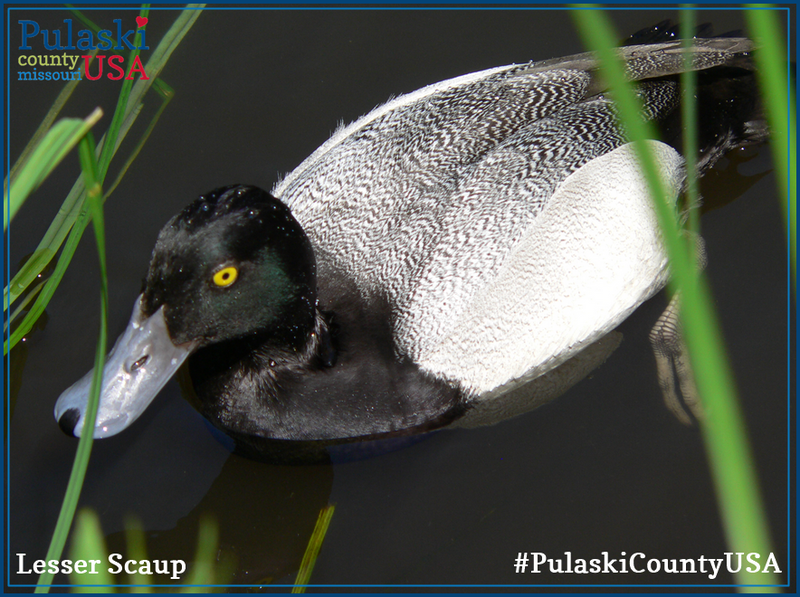 Lesser Scaup is a waterfowl species that can be seen in the wild at Bloodland Lake on Fort Leonard Wood in Missouri. Bird watchers ers have identified over 30 other species of wild birds in this area. Roubidoux Creek Conservation Area is over 175 acres and includes grassland, wetlands, and forest habitats. This area includes over 6 miles of Roubidoux Creek frontage and almost a half mile of Gasconade River frontage. Anglers fishing for Bass, Catfish, and Sunfish seek out the waters of the Gasconade while Trout anglers enjoy the Red Ribbon Trout Stream portion of the Roubidoux Creek. The Deer, Dove, Quail, Rabbit, Squirrel, and Turkey populations make this location popular with hunters also. Almost 100 species of wild birds have been identified in Roubidoux Creek Conservation Area including Wood Duck, Green Heron, Merlin, Wild Turkey, and numerous types of sparrows, tyrant flycatchers, wood warblers, and blackbirds and orioles. 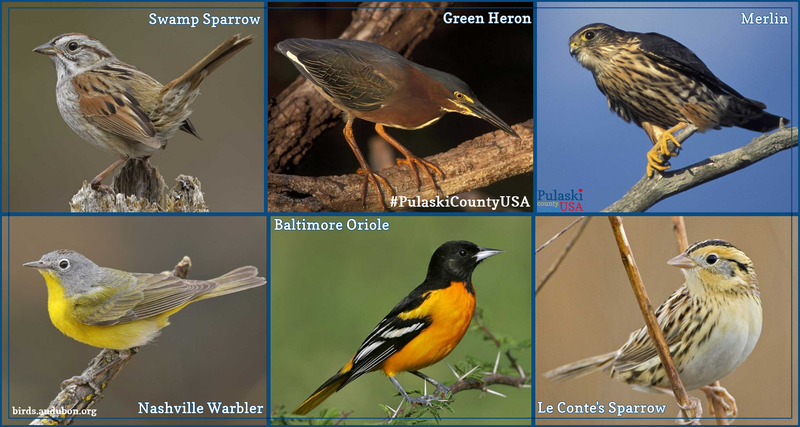 Swamp Sparrow, Green Heron, Merlin, Nashville Warbler, Baltimore Oriole, and Le Conte’s Sparrow are some of the wild bird species that have been identified at Pulaski County’s Roubidoux Creek Conservation Area near Waynesville, MO. Driving directions to Roubidoux Creek Conservation Area: From Interstate 44 take Exit 159. Travel west on Historic Route 66 (Highway 17) to Waynesville. After crossing the Roubidoux River Bridge make a right (north side) onto Revere Lane. Parking area is one mile north of Waynesville on the north side. 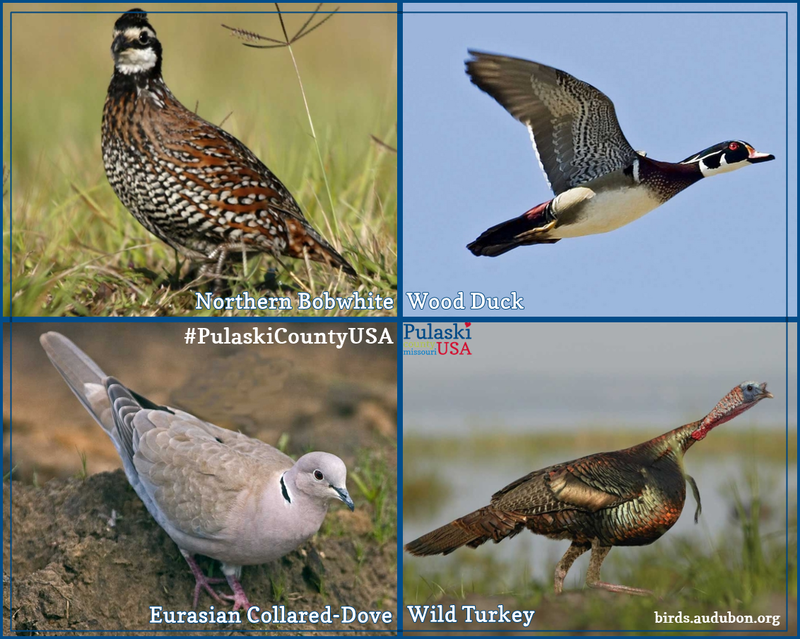 Northern Bobwhite, Wood Duck, Eurasian Collared-Dove, and Wild Turkey are some of the game birds that you will see at Roubidoux Creek Conservation Area near Waynesville, Missouri in Pulaski County. Ryden Cave Conservation Area is a remote 30 acre area that includes two caves, Ryden Cave and Stockpen Cave. Both caves are closed to the public to help prevent the spread of White-nose syndrome in bats. However the area is open for birding and 15 species have been identified to date including Red-bellied Woodpecker, White-throated Sparrow, and Dark-eyed Junco. At Ryden Cave Conservation Area in Pulaski County, near the community of Duke, Missouri birders will see White-throated Sparrow and Dark-eyed Junco. Driving directions to Ryden Cave Conservation Area: From I-44 take Exit 169 and go south approximately 17 miles on J Highway. Turn right on K Highway. Continue onto Western Road. Continue onto County Road TT-825. Ryden Cave Conservation Area is on the left (south) side. 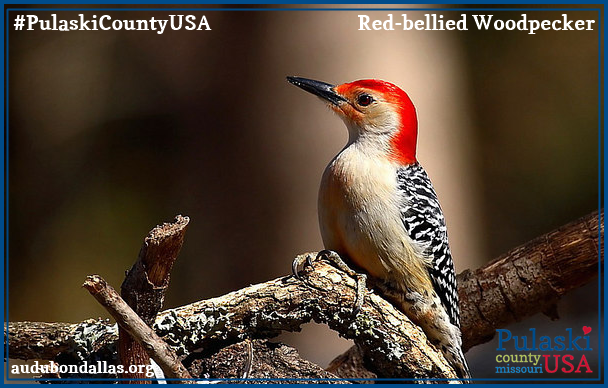 Bird watchers will also have an opportunity to spot Red-bellied Woodpeckers in the wild at Ryden Cave Conservation Area in Pulaski County. Mitschele Access includes a boat ramp which makes it a popular spot with boaters in Pulaski County. Canoeist also use this public access when starting or ending a float trip along the winding Gasconade River. This one acre area has a good population of Bass, Catfish, and Sunfish and a fair population of Suckers. Wild birds also enjoy Mitschele Access- over 30 species have been identified here, including: Louisiana Waterthrush, Eastern Kingbird, Carolina Wren and Red-winged Blackbird. Mitschele Access, on the Gasconade River near Richland, Missouri, is a favorite spot for bird watchers to observe Eastern Kingbird, Red-winged Blackbird, and Carolina Wren. Mitschele Access is a great birding location year round with Spring, Summer, and Autumn the most active. Cliff Swallows can be seen nesting on the bridge. 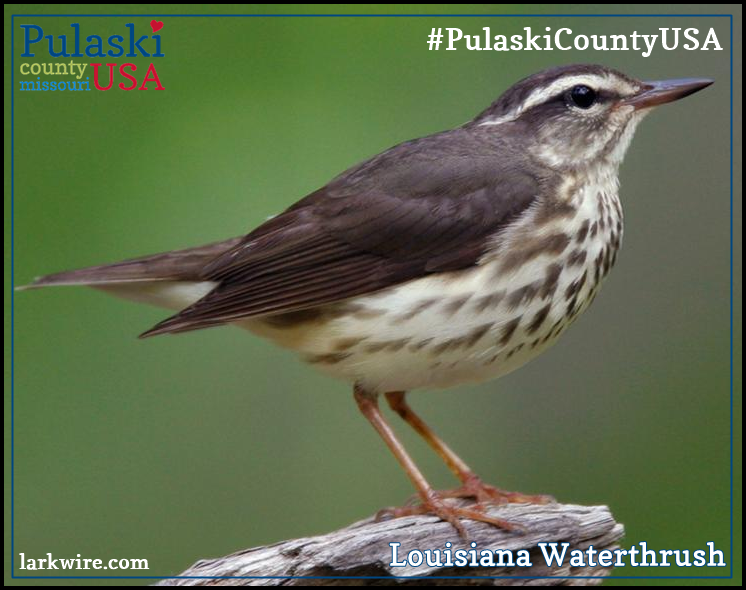 Birders can also spot Louisiana Waterthrush at Mitschele Access in Pulaski County, Missouri. Driving directions to Mitschele Access: From Interstate 44 take Exit 150. Travel north on Highway 7 about 3 miles to the Gasconade River Bridge. Entrance to the access is on the left (north) side of Missouri Highway 7. Riddle Bridge Access also includes a boat ramp which makes it a popular spot with boaters in Pulaski County. Canoeist also use this public access when starting or ending a float trip along the twisting Gasconade River. This 9 acre area includes wetland, grassland, and forest and woodland habitats. Riddle Bridge Access has a good population of Bass, Catfish, and Sunfish and a fair population of Crappie. The bridge is the start of an 18-inch Smallmouth Bass Special Management Area that extends to the Route D bridge at Jerome in Phelps County. Popular with canoeist and anglers, Riddle Access is also a great spot for birding. Almost twenty species have been identified here including several types of woodpeckers, Tufted Titmouse, White-breasted Nuthatch, and Turkey Vulture. Wild birds are plentiful at Riddle Bridge Access near Saint Robert, Missouri. Tufted Titmouse, Turkey Vulture, and White-breasted Nuthatch have been identified here. Driving directions to Riddle Bridge Access: From I-44 take Exit 161 and travel six miles south of Saint Robert on Highway Y. The entrance is on the left immediately before the Gasconade River Bridge. Ross Access is popular with canoeist on the scenic Big Piney River. This 4+ acre area has a good population of Bass, Catfish, and Sunfish and a fair population of Crappie. A portion of this area is a 15-inch Smallmouth Bass Special Management Area. It is also a popular place for swimming and rock skipping. Almost a dozen species of wild birds have been identified in this forest and woodland habitat, including Great Egret, Bald Eagle, Red-shouldered Hawk, and Yellow-belted Sapsucker. Bird watchers might spot a majestic Bald Eagle at Ross Access in southern Pulaski County, Missouri. 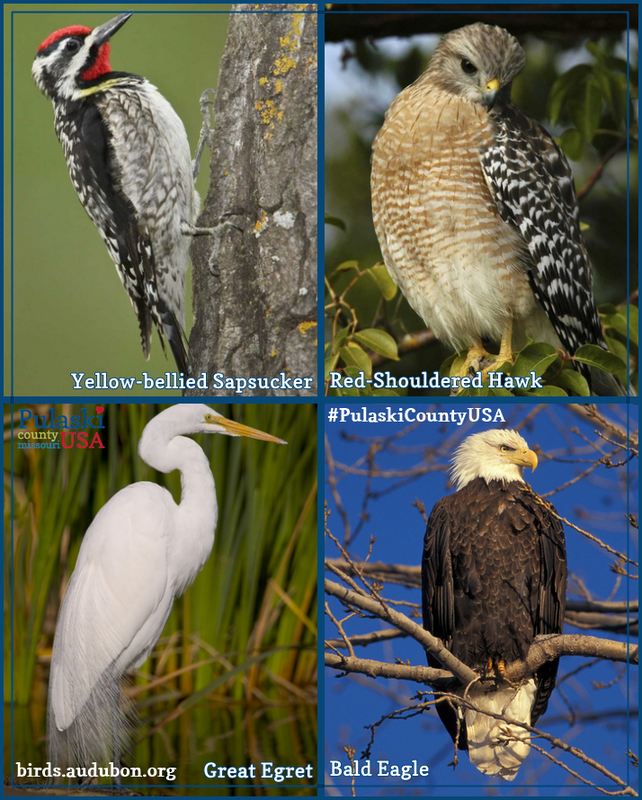 Yellow-bellied Sapsucker, Red-shouldered Hawk, and Great Egret have also been identified at Ross Access on the Big Piney River. Driving directions to Ross Access: From I-44 take Exit 169 and go south approximately 17 miles on J Highway. Turn right on K Highway and travel approximately 2.5 miles onto Western Road. Take Western Road to Windsor Lane. Go approximately 0.5 mile north on Windsor Lane. Schlicht Springs Access is a 12 acre handicap accessible area near the former Schlicht Mill, dating back to the 1840’s, which was once a popular resort and boasted a lodge, post office, and general store. The area was named after John Schlicht who purchased the mill in 1876. Today, Schlicht Springs is popular with boaters and canoeist for its boat ramp. It is also popular with anglers who fish the Gascoande River’s good population of Bass, Catfish, and Sunfish and its fair population of Crappie. The area is made up of grassland and forest and woodland habitat. 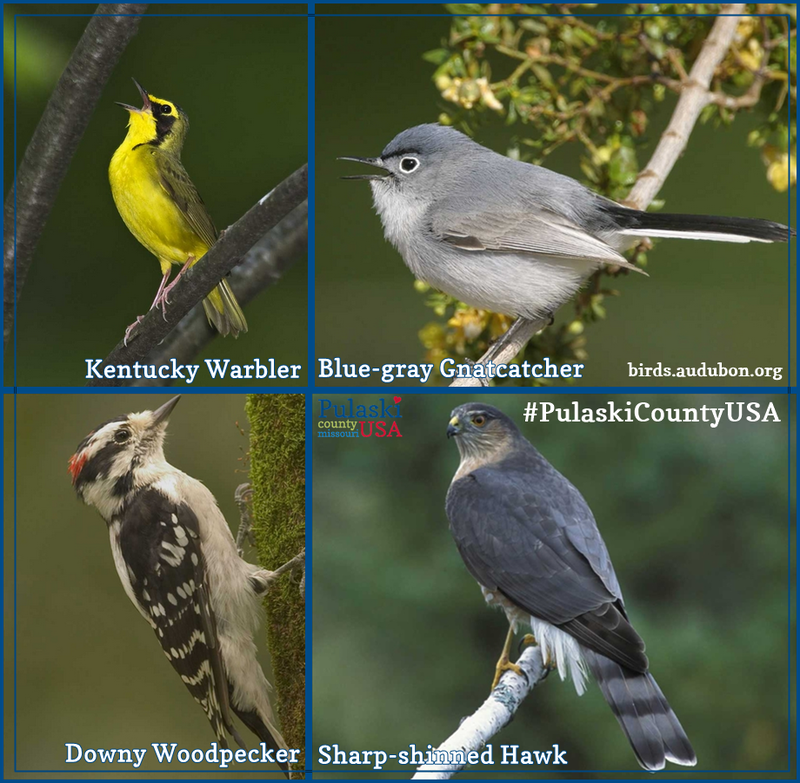 Birders have identified over 20 species of wild birds including Sharp-shinned Hawk, Downy Woodpecker, Blue-gray Gnatcatcher, and Kentucky Warbler. Driving directions to Schlicht Springs Access: Traveling from Crocker Missouri, take Highway 133 which heads south and west of Crocker approximately five miles to Resort Road. Turn south (Left) on Resort Road and travel approximately 1.25 miles to Riverside Road. Turn east (left) on Riverside road and travel approximately one mile to the access. Dixon Towersite is known for its good population of deer, squirrel, and turkey and is accessible to hunters. Most of this areas 48 acres is Oak-hickory forest and woodland. 22 species of birds have been identified here including Turkey Vulture, Barred Owl, Mourning Dove, and several types of woodpeckers. 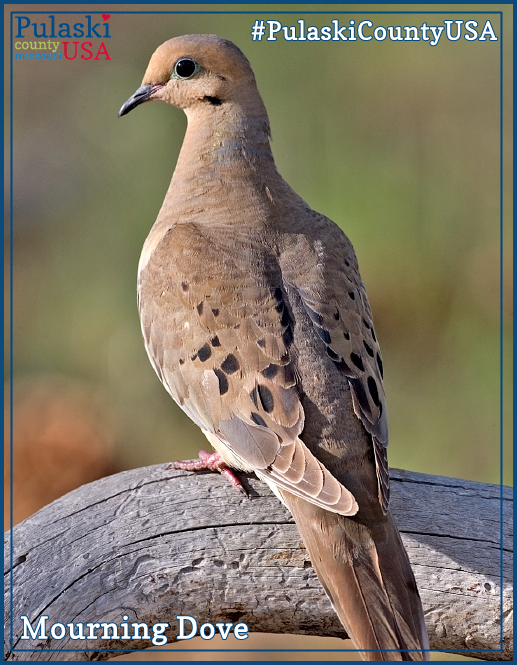 Mourning Dove has been identified at Dixon Towersite in Pulaski County, Missouri. Bird watchers have also spotted Barred Owl and Turkey Vulture at Dixon Towersite near Dixon, Missouri. In late spring and summer expect to see Pine Warblers, Chipping Sparrows, Eastern Wood-Pewee and Great Crested Flycatchers. 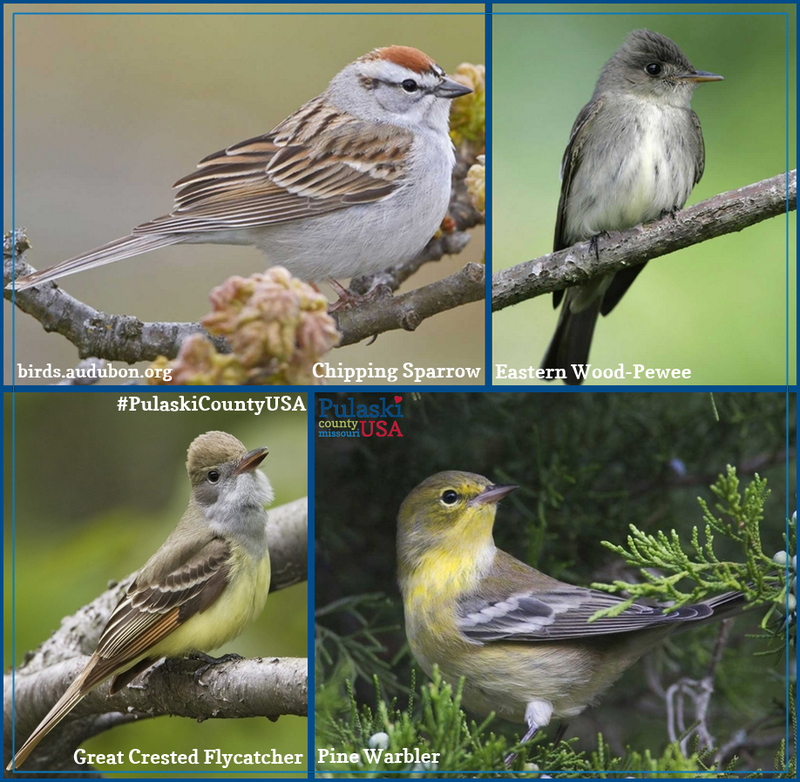 In late spring and summer expect to see Pine Warblers, Chipping Sparrows, Eastern Wood-Pewee and Great Crested Flycatchers at Dixon Towersite in Pulaski County. Driving Directions to Dixon Towersite: Travel three miles west of Dixon on Highway 133. Site entrance is on the left (southeast) side. Fort Leonard Wood Towersite is also known for its good population of deer, squirrel, and turkey and is accessible to hunters. This area has over 60 acres of forest and woodland and 26 species of wild birds have been identified here. Some of these include Great Horned Owl, Red-tailed Hawk, and Purple Martin. Birders have spotted Purple Martin, Red-tailed Hawk, and Great Horned Owl at Fort Leonard Wood Towersite in Saint Robert, Missouri. Driving Directions to Fort Leonard Wood Towersite: From Interstate 44 take Exit 161. Travel one mile east of Saint Robert on Z Highway. Entrance is on the right (south) side. Laughlin/Roubidoux Parks (Waynesville)is part of the public park system in the city of Waynesville. This site includes a town habitat and frontage on Roubidoux Creek. This area includes White Ribbon and Red Ribbon Trout Areas. Roubidoux Spring has a flow of almost 38,000,000 gallons per day and is also a popular recreational spot for cave certified scuba divers. Laughlin Park is also one of only seven sites on the Trail of Tears National Historic Trail in Missouri. Waynesville also maintains a tree identification area in Roubidoux Park. A brochure is available at City Hall, located at 601 Historic Route 66. Wild birds love Laughlin/Roubidoux Parks as well, with over 50 species identified to date. Some of these include Mallard, Great Blue Heron, Ruby-throated Hummingbird, Northern Cardinal, Indigo Bunting, and Song Sparrow. Laughlin/Roubidoux Parks (Waynesville) is an urban wild bird oasis. Bird watchers have identified Ruby-throated Hummingbird, Great Blue Heron, Indigo Bunting, and Song Sparrow. More than 40 other species have also been spotted at the parks. Driving directions to Laughlin/Roubidoux Parks (Waynesville): From Interstate 44 take Exit 159. Travel west on Historic Route 66 (Highway 17) to Waynesville. Laughlin Park is on the left (south)side immediately before crossing the Roubidoux River and Roubidoux Park is on the right (north) side immediately before the bridge crossing. Both parks are downstream from Roubidoux Spring. Laughlin and Roubidoux Parks in Waynesville are a great place to see Northern Cardinal. 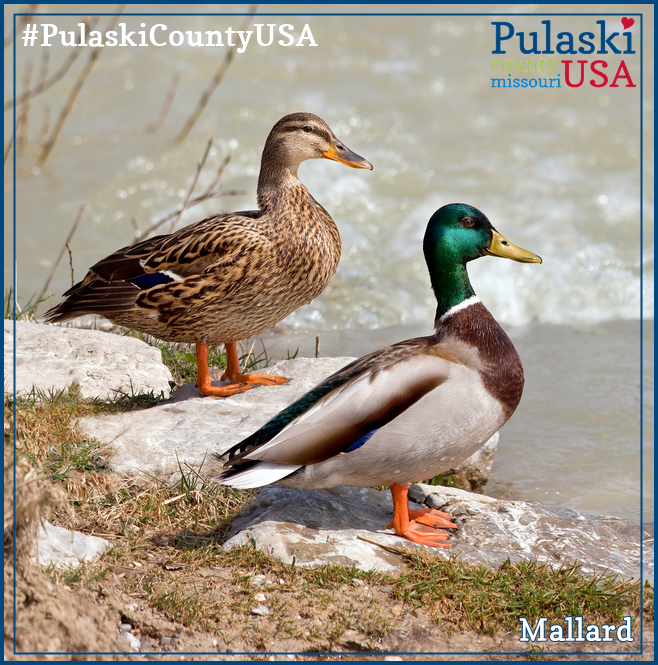 Mallards enjoy the waters of the “Roaring Roubidoux” as much as humans do! For more information on bird watching in Missouri visit The Audubon Society of Missouri at http://www.mobirds.org or http://www.facebook.com/153704444682191. 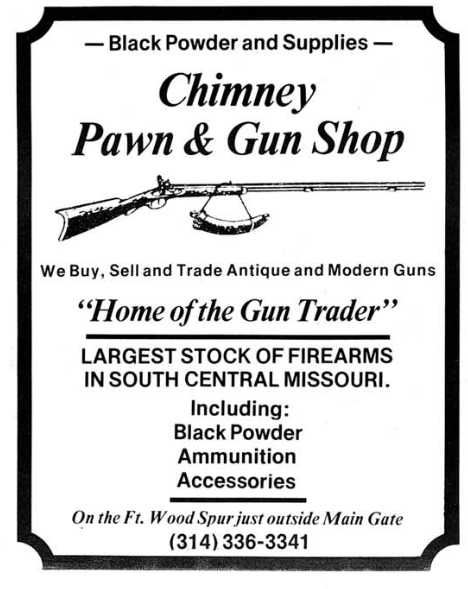 Chimney Pawn & Gun Shop advertisement as published in the 1984 edition of Old Settlers Gazette. 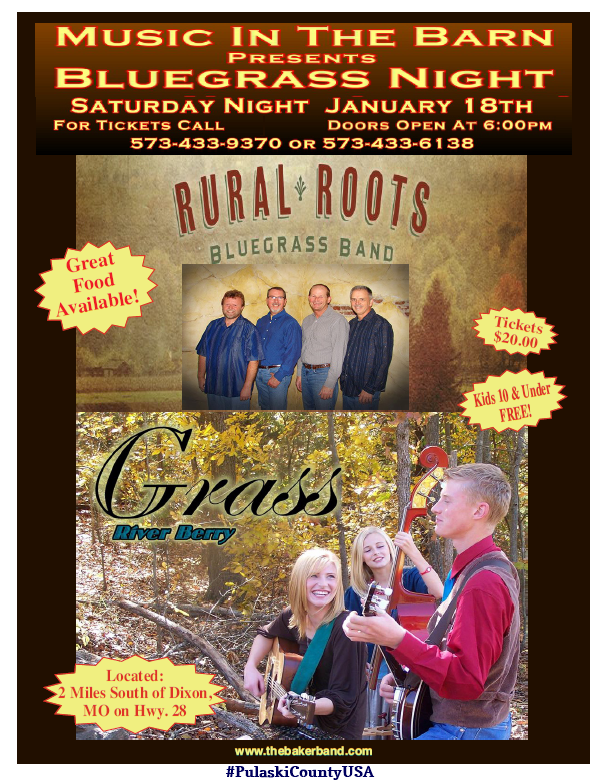 Bluegrass In The Barn is a great time for the entire family! 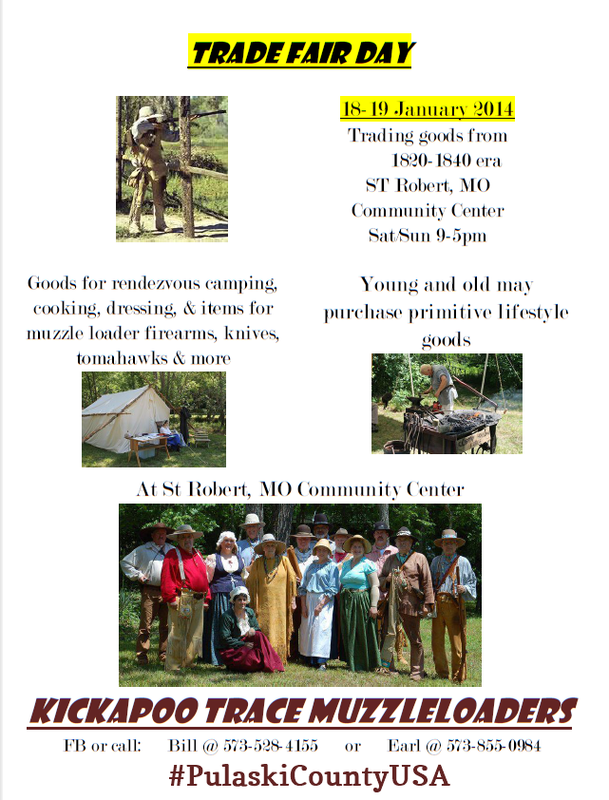 The Kickapoo Trace Muzzleloaders Trade Fair is sure to be a hit with primitive lifestyle enthusiasts!